Wake Forest is launching a long-term initiative to partner with the International Baccalaureate Program offered by the Winston-Salem/Forsyth County Schools. Wake Forest will host a community forum on the International Baccalaureate Program (IB) at 7 p.m. Dec. 14 in Carswell Hall’s Annenberg Forum. The event will provide information to Forsyth County families and students about the program’s curriculum and its value in helping students prepare for college. Students and their parents from the three local IB schools will talk about their experiences with the program. Students who completed the IB program and then enrolled at Wake Forest will also share their experiences. Introduced to the Winston-Salem/Forsyth County Schools in 2002, the IB program is available at Parkland Magnet High School, Paisley Magnet School and Ashley Elementary School. It is open to any highly motivated student who wants to participate. Students may join the program before they enter high school or in high school. Developed initially in Europe, the program offers a rigorous comprehensive curriculum requiring students to demonstrate knowledge and skills in six academic areas: English, foreign language, math and computer science, individuals and societies, the arts, and experimental sciences. The program places an emphasis on global awareness and community service. Participants may take exams in their senior year of high school to receive the IB diploma, which is separate from the regular high school diploma. “Accomplished IB students are well prepared for the rigors of the most selective colleges and universities around the country and the world,” said Wake Forest Director of Admissions Martha B. Allman (’82, MBA ’92). Wake Forest’s support of the program will come in many forms. University faculty are providing guest lectures and carrying out special projects in the local IB schools. For example, math professors have already shared their expertise on topics such as calculus and statistics; biology professors have led science demonstrations; and other professors have lectured on mythology and other topics. 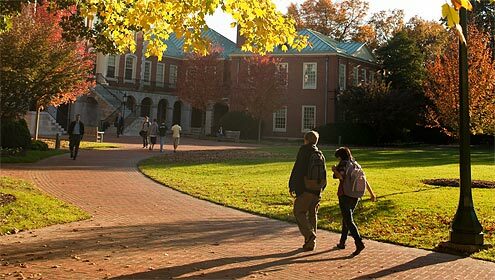 IB students will also come to Wake Forest for lectures and presentations, and attend University cultural events. IB students in grades 10 and higher will be able to use the Z. Smith Reynolds Library. Wake Forest’s support of the IB program in Forsyth County began gradually in recent years, initially through individual faculty members with children attending the schools. In recent months, University faculty and administrators joined forces with the schools to create a more structured, expanded effort. A committee formed by the University and the schools meets to develop and implement initiatives. It is led by Professor and Chair of Mathematics Stephen Robinson. His son, Sam, graduated at Parkland with the IB diploma and is now a Wake Forest freshman. He has another son, Scott, at Paisley who is working toward an IB diploma. He anticipates that Wake Forest support of the program will continue growing, as more faculty and staff volunteer to participate.